Sick of lonely nights at home browsing feeds? Free tells you which friends are…free…and let’s you ask if anyone wants to meet up without making you look desperate. Launching today on iOS, Free lets you announce plans or that you’re flexible, and group chat to organize your congregation. It’s like a green dot online status indicator for your real-life availability. Free was co-founded by Path’s Danny Trinh, a true man-about-town with insights from his ex-employer’s missteps. “It was so frustrating. We were working on a core utility that everybody already had a behavior pattern for elsewhere” Trinh tells me. But instead of another photo sharer or Facebook clone, he’s raised $1.9 million from top seed funds like Social+Capital, Google Ventures, Lowercase, First Round, and SV Angel to fill an emptiness in our lives. Free adds transparency to spontaneity so we know when we could spend time together. Gathering with a few pals can turn a meal, weekend, post-work drink, or late night chill out into something memorable. While Foursquare, Facebook Nearby Friends, Plancast, and many more have tried and failed, Free nails the nuances necessary to get us out of our shells. I’ve thought a lot about these nuances myself. Why are people scared to say they’re not doing anything? Who do you notify when someone’s available? How do you keep people from feeling ignored? That’s because a year ago I advised a startup called Signal trying to do the exact same thing as Free. After frustrations on these key points, the founder moved on to another project and Signal is possibly permanent stasis. 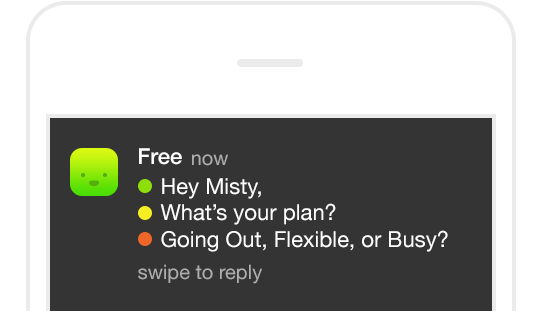 Yet Free seems to have figured them out with subtle language and clever design tricks. I’m an extreme extrovert, and one of the only people I see out as much as me is this 24-year-old spitfire Danny Trinh . If anyone could build this, it’s him. The other big contenders like Foursquare and Facebook Nearby friends missed the mark by focusing on where we are, not what we want to do and who to do it with. A friend checking in at the bar down the street isn’t an invitation. Trinh left Path a year and a half ago to start Free. He had realized “I could sit on the couch and browse feeds for hours and it kinda made me sad.” But blindly reaching out to friends to see if they wanted to hangout seemed dorky. That type of communication didn’t fit with the “Success Theater” of Facebook that he’d read about in a New York Times piece by Jenna Wortham. We hide the uncool parts of our lives and only share what will get plenty of likes. He needed to build a new app that didn’t bruise our egos when we desire connection. “Steve Jobs said the computer is the bicycle for the mind” Trinh tells me. “I wanted social bicycle, the thing that made the manual, tedious process of finding friends and getting them together way more efficient.” So Trinh poached an old colleague from Digg, Kelvin Kakugawa, away from his job at Goldman Sachs and they started relentlessly iterating on the idea for Free. After several scrapped versions, today it’s ready for the public. The core of Free is a cartoony status composer that lets you say that you’re Going Out, Flexible, or Busy. You can also add some text, a location, time frame, or tag friends to suggest what you might do together. These statuses go into Free’s feed that you can quickly flick through to all your friends’ plans, and disappear the next morning. And you can kill off your status at any time if plans change. If you say you’re Going Out or Flexible, a push notification will go to friends in your current city that you added through your phone contacts or Twitter. If you want to do something more private, you can choose to notify just a subset of your friends, or mute the status so people don’t get pinged and will only see it in the Free feed. Anyone who’s Busy won’t be bothered so they don’t get FOMO. Using the term “Flexible” is an extraordinarily smart move. It can mean you’re not doing anything, but doesn’t seem nearly as embarrassing to broadcast. Friends can respond to your Free status in a private message thread. If they can’t join you, Free lets them choose from a few pre-populated decline messages like “Miss you” or “Hang soon!” This avoids people being met with silence when they post a status, which could deter them in the future. Everyone who says they can join gets placed into a group chat thread where they can organize meet up plans, heart each other’s messages, drop a location pin, send a photo with an emoji sticker stuck on top, or record a few-second video that’s turned into a cute auto-looping GIF. To spark usage, Free sends out a “Weekend Roll-Call”, asking people what they’re up to on Fridays and Saturdays. There are also adorable little stickers for asking someone if they’re hungry or want to grab drinks, which make it even easier to reach out in private message threads. My favorite is Street Fighter’s E. Honda doing his Hundred Hand Slap attack in the “Hit Me Up” sticker. Free even works with people who don’t have the app. If you select a contact from your phone as a favorite, they’ll get text messages with your Free status. That oughta help with growth since it’s not on Android yet, though it is coming to Apple Watch. Overall, Free feels lightweight yet does enough things texting can’t that makes it worth using. It unlocks the potential of our leisure time. Don’t let the name fool you. Trinh has plans to make Free a business and make good on his $1.9 million seed from Social + Capital Partnership, True Ventures, Google Ventures, Chris Sacca’s Lowercase Capital, First Round Capital, SV Angel, Homebrew Ventures, Cowboy Ventures, Upside Partnership, Slow Ventures, Bobby Goodlatte, Hugo Barra, and his old boss Dave Morin. Trinh speaks of expanding to helping you meet new people, but non-dating apps in that space like Highlight haven’t seen much traction. Free should do this naturally when friends bring their buddies with them to hang out. The real opportunity is connecting people who’ve expressed intent to do something like get dinner or drinks with the businesses that sell these experiences. It’s easy to imagine Free triangulating a restaurant between three friend who say they’re hungry, and serving you a paid suggestion to go there. Free’s biggest challenge will be opening up this behavior pattern of announcing your availability, and tearing us away from text messaging and apps like Facebook Messenger. Teaching people something new is never easy, but the rewards of real-world interaction with people you care about could be enough to get us over the hump. Free is never going to replace the texting giants, but it doesn’t have to. “Free is at the top of the funnel”, Trinh explains. “The hardest part about texting is not knowing who to text. If you chat in Messenger after finding people on Free, that’s fine. We’ve already delivered our utility.” Still, we might like the sound of Free, but inevitably slip back to texting if it can’t hold our attention. Pointing at his phone, Trinh laments that “Before this software, all this aluminum and glass did little to impact my real world friendships.” Plenty of apps clam to make you more connected, but they’re only bonding our digital selves. Two friends alone in their homes looking at photos of each other is a pretty bleak view of connection. But if Free can gain network effect, it could change the course of our social lives.